As the 19th century drew to a close, the Third French Republic was becoming increasingly wary of its neighbour Germany. With a larger, faster growing economy industry and advanced military technologies, it was rapidly becoming a worrying factor in French foreign policy, due to its military aggressiveness. This sentiment was shared by the Russians, who believed that the German military might was a threat to the whole of Europe. Beginning in 1891, a series of talks began which eventually led three years later to a Military alliance between the two nations. The belief was that the two nations together could contain the German forces and deter any offensive that might be planned. Eventually, France and Britain signed treaties to improve relations and subsequently brought Russia into an Alliance. Thus the “Triple Entente” was born. 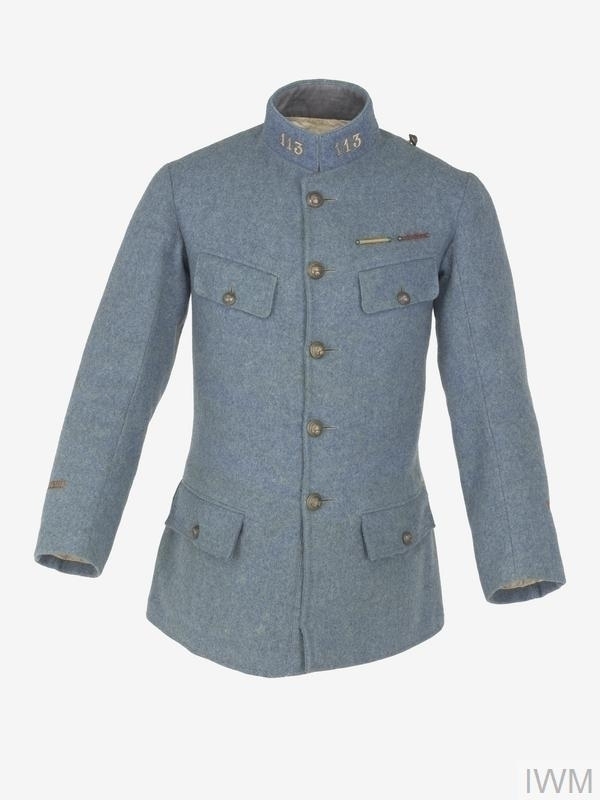 Description: The French pre-war military jacket worn by poilus. 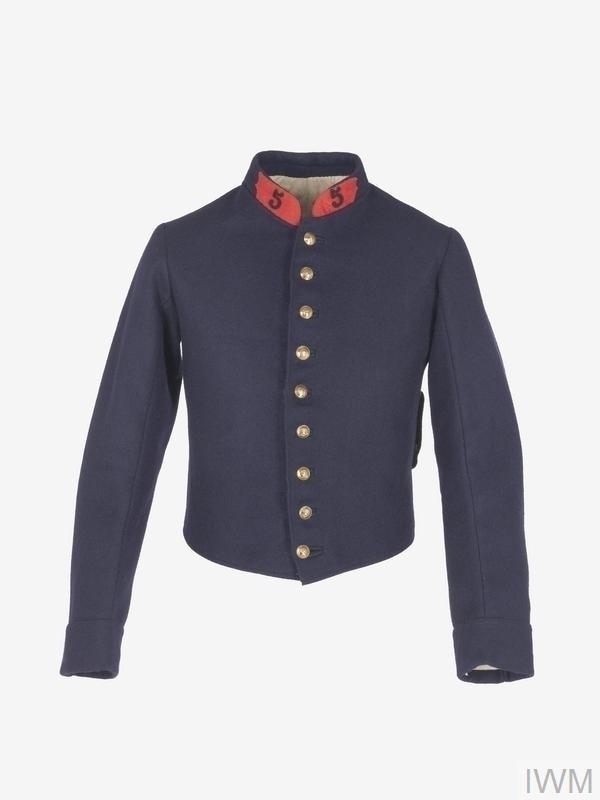 Note the lack of pockets and the bright red collar, making the soldier easier to spot. When Russia went to war against Germany in defence of Serbia, the French also mobilised. However the Germans knew of the alliance between the two nations and had devised a plan to rapidly deal with France, so that the majority of its forces could be focused against the larger threat of Russia. This plan involved moving forces through Belgium however, which would violate the neutrality of the nation. This move angered the British and brought them into the war as well. At the outbreak of war, the French forces were in a poor state of affairs. Outdated tactics and equipment from the Napoleonic era meant that the military was not ready to take on a well-planned assault from the German military. Their soldiers (poilus) were poorly equipped and wore bright uniforms, which meant they were easy targets for the Germans, who were far more advanced technologically. The British and the remaining Belgian forces managed to delay the German forces sufficiently to allow the disorganised French forces to construct defences and stop the German advance. French counterattacks were met with automatic weapons fire and heavy artillery fire. After several costly attempts, the French constructed their own defences and began a war of attrition. 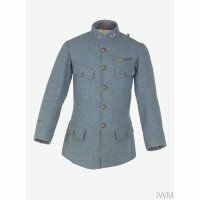 Description: The "Horizon Blue" military jacket as worn by French poilus. 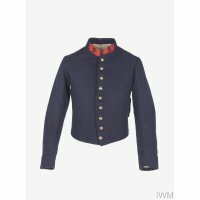 This outfit was much more suited to the trench warfare of the First World War, being harder to spot and with pockets for soldiers to carry more equipment. In 1917, due to poor conditions, high casualties and a general sense of hopelessness from repeated failed attacks, approximately 40% of the French army mutinied, demanding that the attacks stop and the army have a chance to pause for breath, resupply and treat casualties. French weapons were notoriously outdated and inefficient at the start of the war, often becoming jammed due to dirt from the trenches. This meant that soldiers often had to resort to using bayonets – against machine guns. Fortunately for the French, the Germans did not learn of this insubordination and did not attack during this trying time. Eventually the French commander-in-chief Phillipe Pétain brought in reforms that would give the soldiers on the frontlines more time on leave to boost morale, as well as rethinking the strategies for assaults. It would not be until 1918, when American support arrived and tanks were provided, that the French would attempt a full frontal assault again. The next assault occurred during the second battle of the Marne. The Germans attempted what would be their last attack of the war, but were met with an incredibly strong counterattack composed of French and American infantry, along with several hundred tanks. The French, now recovered from their darkest period, were motivated and had a stronger morale. This attack decisively proved that victory was possible against the Germans through the use of combined arms tactics. The war ended three months later.